Summer, sadly, is over. 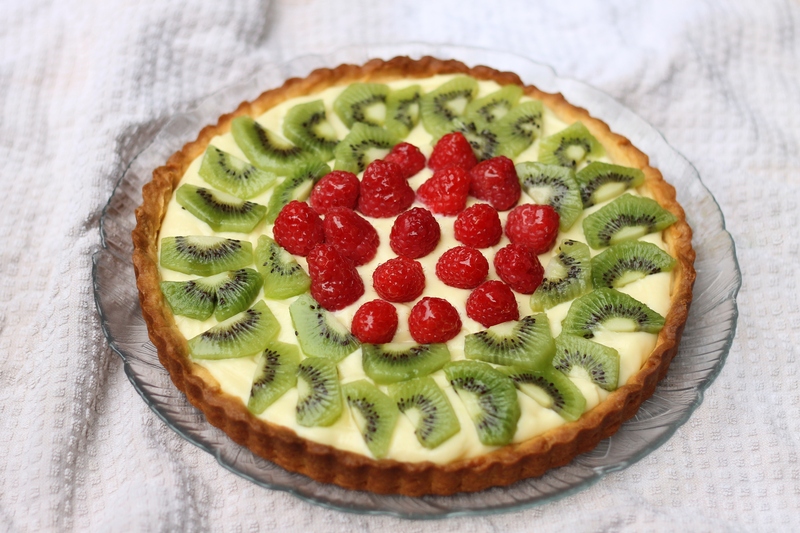 But on the off chance you still have some fresh fruit sitting around, you should definitely make this tart. If you are unable to accept that fall (which is a great season, but marks the start of school) is here, it may make you forget for a moment that it is eight more months until summer! Don’t worry, if you are totally thrilled that it’s fall, we have some pumpkin recipes coming your way in the next couple of weeks. But in the mean time, this tart serves as a perfectly delicious dessert! We all loved it. P.S. We were running a little low on fruit, so there is less on ours than there should be. We feel that it would have benefited from more fruit, and the recipe below will note the proper amount that you should use. To make the tart shell, whisk together the egg yolk, cream and vanilla in a small bowl; set aside. Place the flour, sugar, and salt in a food processor. Process briefly to combine. Scatter the butter pieces over the flour mixture; process to cut the butter into the flour until the mixture resembles coarse meal, about fifteen 1-second pulses. With the machine running, add the egg mixture and process until the dough just comes together, about 12 seconds. Turn the dough onto a sheet of plastic wrap and press into a 6-inch dish. Wrap in plastic wrap and refrigerate at least 1 hour or up to 48 hours. To make the pastry cream, heat the half-and-half, 6 tablespoons of the sugar, and the salt in a saucepan over medium-high heat until simmering, stirring occasionally to dissolve the sugar. Meanwhile, combine the egg yolks and remaining 2 tablespoons sugar in a medium bowl and whisk until the sugar has begun to dissolve and the mixture is creamy, about 15 seconds. Whisk in the cornstarch until combined and the mixture is pale yellow and thick, about 30 seconds. When the half-and-half mixture has reached a simmer, slowly add it to the egg yolk mixture to temper, whisking constantly. Return the mixture to the saucepan, scraping the bowl with a rubber spatula. Return the mixture to a simmer over medium heat, whisking constantly, until a few bubbles burst on the surface and the mixture is thickened and glossy, about 30 seconds. Off the heat, whisk in the butter and vanilla. Strain the pastry cream through a fine mesh sieve set over a medium bowl. Press plastic wrap directly on the surface to prevent a skin from forming and refrigerate until cold and set, at least 3 hours and up to 2 days. To assemble the tart, spread the cold pastry cream evenly over the bottom of the tart shell. Arrange the fruit on top of the pastry cream as desired. Heat the jelly in the microwave for 20-30 seconds, just until slightly melted and easy to stir. Using a pastry brush, paint a light layer of jelly over the fresh fruit. Side Note: Baking Illustrated recommends serving immediately, to prevent the fruit from causing the crust to get soggy. We had some the next day, and found it to taste just as good (the pastry cream possibly tasted better chilled). It is likely that if you used more fruit than us you would have this problem, but honestly, we don’t think it’s too much of a concern.